Sierra Mist Mixologists have come up with some Holiday Cocktail Concoctions. They've asked some bloggers to sample them - tough job, right?! My favorite was the "Meet Me At The Mistletoe" - a berry vodka drink with fresh lime & basil. 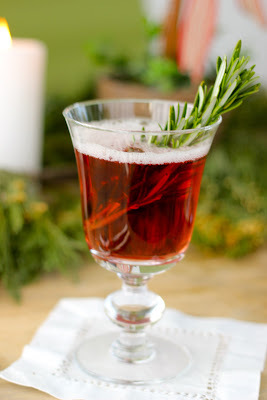 Instead of garnishing with a basil leaf, I used a sprig of rosemary - I love how "Holiday" it looks! Sierra Mist Natural is a great shortcut for cocktails that call for a simple syrup... it was one of my secrets as a caterer. It is different than other sweet sodas because like real simple syrup (that is reduced sugar and water), it is made with real sugar, no artificial ingredients, 100% natural flavoring - and I love the fizz that it adds to my cocktails. If you like any of these drink ideas, "like" the Sierra Mist Natural Facebook page and check it out for more recipes from their Mixology page! *Sierra Mist provided me with compensation to include their product on my blog! Here you will discover all the Fresh beautiful Mistletoe available on here for offer. You can discover fresh and high top quality Mistletoe for delivering someone and also for your house and your lawn for Xmas. We offer you the best Mistletoe in very inexpensive prices from others.